For a chance to experience a millionaires lifestyle and for a holiday vacation with a difference come and indulge yourself on board our 'floatel' at Marina D'Arechi at the start of the Amalfi Coast. Floatel - convenience and luxury with a difference........... The sumptuous 3 cabins are fully air-conditioned with their own heads [bathrooms] to accommodate 6 guests in total elegance and comfort thanks to the ingenious use of the interior space and deck design. Rich in soft light leather, the luxurious soft furnishings of the air- conditioned interior saloon provide a shaded sanctuary from the sun-filled skies. Our stunning Rizzardi CR50 Top Line is a classic Italian designed and built motor yacht with a dynamic personality and touch of luxury to match, is now ready for your pleasure, either as a flaming hotel or for a fantastic charter exploring the romantic Italian coastline and her islands. 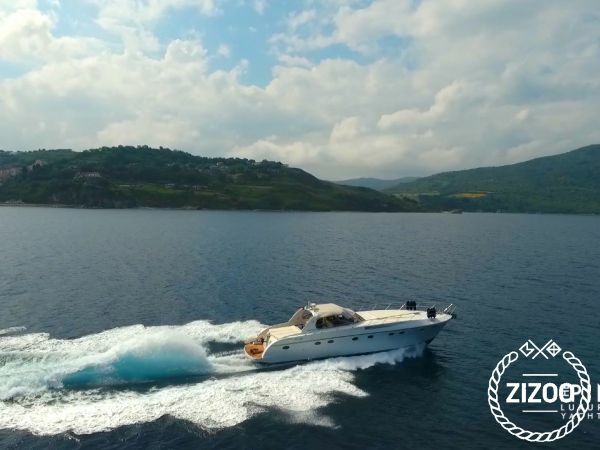 Powerful and sporty, it is the ideal yacht for single or multi-day charters along the Amalfi coast, its islands of Capri, Ischia and Procida and to discover the secrets of southern Italian waters such as Castellabate, Pisciotta, Camerota and so much more. Measuring over 16 metres with a sleek hull created to cut effortlessly through the waves, The Pinelli can comfortably reach cruising speeds of 28 knots, and the spacious decks and layout allows up to a dozen people to come on board and enjoy port/restaurant hopping along the beautiful coastline. Featuring two expansive sun decks, one accessible from the aft and the other one from the bow. The Pinelli offers the perfect blend of head-turning Italian built style and unbridled power. Best of all, the only decisions you have to make are which drink you fancy and which destination you want to head towards. Then, simply sit back, feast your eyes on the breathtaking views and enjoy the fully-crewed ride.